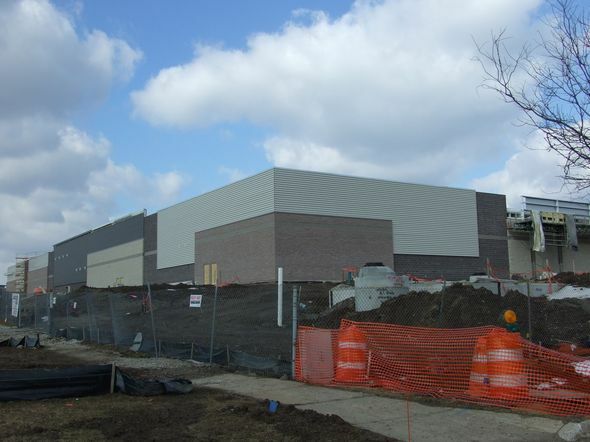 The Costco warehouse store construction site in Pittsfield Township in February. As construction continues at the new Costco warehouse store in Pittsfield Township, the company recently announced an official opening date. The store just south of the city limits of Ann Arbor will open July 26. Costco is building a 148,000-square-foot store with 720 parking spaces and a gasoline station, located on a 17-acre site in the Airport Plaza industrial park near the corner of State and Ellsworth behind Tyner’s Furniture store. 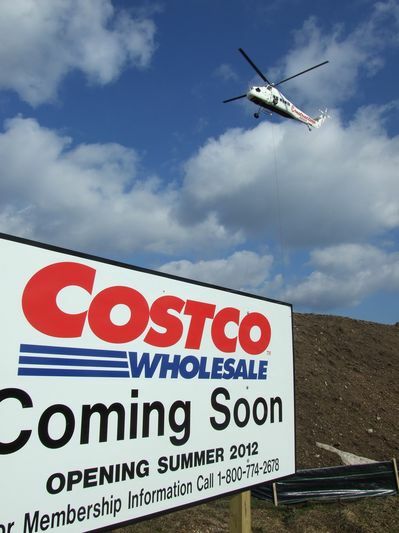 A helicopter hoisted 14 HVAC units -- one by one -- onto the Costco roof in February. Signs at the site read “Coming Soon: Opening Summer 2012,” and the company recently posted the official opening date on its website. Costco has not announced its hiring plans and there don’t appear to be any online job postings yet. Final plans for the project received approval from the Pittsfield Township Planning Commission in early August, and local developer Jake Haas sold the land to Costco Wholesale Corp. in September for $7.34 million, according to township documents. Crews started demolition of eight office buildings in late September, and construction moved quickly this winter thanks in part to favorable weather. The contractor for the project is Seattle-based Jackson Dean Construction. The building’s steel structure was erected in December and a helicopter hoisted 14 HVAC units onto the roof in February. Work even continued at the site in 0 degree Fahrenheit weather one day in January. Fri, Apr 6, 2012 : 8:49 p.m.
the fun begins.more traffic added to an already congested area. Fri, Apr 6, 2012 : 12:43 a.m. Seriously? Costco stinks. You pay for a membership. You pay more for larger quantities and last years goods. Finally, for most items Sams' Club is cheaper (and that stinks too). Finally, why does every place have to have the exact same thing as every other place? Like Brighten and Canton were really far. Thu, Apr 5, 2012 : 3:58 p.m.
Thankyou Scio Twp., thank you! Thu, Apr 5, 2012 : 2:39 a.m. Wed, Apr 4, 2012 : 11:17 p.m.
Roundabouts in Washtenaw County are far too small to work. Cars zoom through without looking, trucks and buses are driving on the elevated center and some trucks nearly tip over due to speed and instability, no one yields to traffic already IN the roundabout. Poor decision to add a roundabout near Costco. Give them their own light and entrance like IKEA in Canton. No roundabout needed. Wed, Apr 4, 2012 : 11:34 p.m. Wed, Apr 4, 2012 : 10:46 p.m.
That might be the worst programmed traffic light in the area, though. It assumes Ellsworth is a side street, and waits are so excessive that I see people occasionally running the light. Hopefully it will get reprogrammed when Costco opens - a dedicated entrance lane into the property will help. I'm wondering about left turns out onto Ellsworth, though. The good news is that if the intersection is designed properly and the lights programmed properly, it can handle a lot more traffic. That's probably why Costco chose it. Fri, Apr 6, 2012 : 8:51 p.m.
good luck with the design? Wed, Apr 4, 2012 : 7:27 p.m.
Maybe Costco doesn't need to sell Wine - there is enough winning here about the traffic to serve us all! Welcome Costco - look forward to shopping and filling up with your cheaper gas often! Wed, Apr 4, 2012 : 10:36 p.m.
Costco will sell cheese to go with that whine....um.....wine. Wed, Apr 4, 2012 : 5:47 p.m. I am local for food and local first for everything else except: paper goods, electronics, and various other things that really aren't made or sold by local stores plus this will draw me to the Zing's as a treat. I am WAY looking forward to COSTCO being here and I am excited about this date. Wed, Apr 4, 2012 : 4:43 p.m. The up side of all this is the fact that Costco treats its employees with respect.There is a lot of difference how Costco and its competitors treat their workers.Welcome to Washtenaw county ,lets set a new standard. Great - now how do you safely walk across I-94 on State Street? How about bike? Pedestrians have been killed and seriously injured by vehicles on that section of road. Hello, Ann Arbor City Council? Is anyone there? Wed, Apr 4, 2012 : 2:05 p.m.
As if we needed any more diversion of customer flow from local businesses. Thu, Apr 5, 2012 : 12:16 a.m.
which &quot;local grocery&quot; do you pretend to shop at? Wed, Apr 4, 2012 : 1:41 p.m. Wed, Apr 4, 2012 : 11:14 p.m. Many areas are already very congested and there are many accidents on surrounding highways almost on a daily basis: M-14, 23 N&amp;S through A2, I-94 through A2, etc. Wed, Apr 4, 2012 : 1:32 p.m. It's good to have this important date. I can plan when to begin avoiding this area of Washtenaw County. I feel for anyone who now drives through this area for employment. They're going to be spending much more time in traffic. This area is already a mess to pass through during rush hour. Wed, Apr 4, 2012 : 1:48 p.m.
Way ahead of you. I had traveled that intersection once a day (from work to gym daily) up until a little over a year ago. Even with the time I save now, I'm very happy I changed gyms to avoid it. Maybe the Ann Arbor Airport will become a &quot;destination&quot; for fly-in shoppers. Fly in, walk across the road, have lunch, shop a little, and fly home. Thu, Apr 5, 2012 : 5:22 p.m. Wed, Apr 4, 2012 : 10:35 p.m.
That would be a hoot. Drive by Costco. A shuttle to and from Costco. Love it. Wed, Apr 4, 2012 : 2:18 p.m.
OMG -- my bellylaugh for the day. The lane lines wear off after a few months and need to be repainted frequented. The ones at Maple are long gone. This nearby traffic circle, which is designed to have dual lanes, will lead to confusion as long as the County Road Commission and the City of Ann Arbor fail to keep repainting the lane lines indicating that it is two lanes and not a single lane traffic circle. If people treat it as a single lane, the capacity will be cut in half, causing traffic jams or accidents. I see enough problems with people turning left from Ann Arbor Saline Road onto Waters to go to Best Buy / Meijers. Wed, Apr 4, 2012 : 4:23 p.m.
You mean the SIGNS are not enough? If you cant figure it out from the signs and need a painted road, I suggest staying off the road and saving the rest of us. Is a round-a-bout planned with special instructions for seniors? Fri, Apr 6, 2012 : 12:58 a.m.
Who was the genius that thought roundabouts were a good idea at that corner? They must not have had to ever sit on that corner during rush hour. Wed, Apr 4, 2012 : 2:34 p.m.
Well, I am a senior and I can do round abouts! Why do you younger folk feel we are so incapable? I think it is insulting to seniors with these remarks. Wed, Apr 4, 2012 : 1:25 p.m. Wed, Apr 4, 2012 : 1:02 p.m. I am looking forward to that day. If I am in town I'll be there when it opens. Now I don't have to drive to either Livonia store. My only concern is the pending roundabout. I wonder if people will get used to it. I don't mind, especially now that I have adjusted to the ones on Geddes Road by US-23 and the one in Superior Township. Oh, how sad the plight of those who will never get used to the roundabout. No, hermhawk, people will never ever get used to it as long as we live. 40 years from now, we will see people still approaching, stopping, crying, and still wishing they could somehow get used to something they've known for 40 years. Wed, Apr 4, 2012 : 1:16 p.m. If you have adjusted to those two there? You will be fine with that one as well. On a good day? You can sail thru one of those at top notch speed. Not. Wed, Apr 4, 2012 : 12:15 p.m.
Did Costco get their liquor sale license? Wed, Apr 4, 2012 : 1:05 p.m. Here's the latest I know: Township Supervisor Mandy Grewal said a few weeks ago that Costco had applied to the state for the license. Wed, Apr 4, 2012 : 12:14 p.m. Lousy traffic usually means bicycles rule but not in the case going from Ann Arbor to Pittsfield Township. What is the deal with the i94 crossings from Ann Arbor? With exception of Scio Church Road, you're competing on artillery ravage pavement. It will be interesting to see if the gas prices will be more competitive if the store has a gas station, Ann Arbor in general has been about 10% higher in vs the outlying areas when it comes to buying gas. Fri, Apr 6, 2012 : 8:55 p.m.
depends on the area,the station, the day,and the week. Fri, Apr 6, 2012 : 12:57 a.m.
Hahahaha! Ann Arbor was more expensive when I lived in Ypsi, now that I live back in Tecumseh, Ann Arbor is cheap. Tecumseh is at least 20 cents higher on a daily basis. I always try to fill up before heading home. Thu, Apr 5, 2012 : 5:06 p.m.
You can also use your bank's ATM card with your PIN to buy fuel at Costco, but you have to swipe a Costco membership card first. They only accept Amex for credit transactions in the store or in the fuel stations. Thu, Apr 5, 2012 : 12:12 a.m.
Costco samples 5 staions within a 5 mile radius to match or beat the low price. Usually that is Sam's. You need an AmerExpress or prepaid Costco cash card to buy gas. Wed, Apr 4, 2012 : 11:29 p.m. Wed, Apr 4, 2012 : 11:18 p.m. It's called: Let's see how much we can rip off A2! EVERYTHING is more expensive here. Wed, Apr 4, 2012 : 11:27 a.m. It will probably be open well before the Hieftje and Lowenstein underground Hilton . . . Wed, Apr 4, 2012 : 10:54 a.m. Does anyone know if COSTCO offers gasoline like Sam's does on Carpenter? This article says it does - did you read it ? They did approve a gas station as part of the plans. It'll be on the north side of the store. Wed, Apr 4, 2012 : 10:42 a.m. Location works for me but what happens to traffic remains to be seen. Wed, Apr 4, 2012 : 10:39 a.m.
Thu, Apr 5, 2012 : 11:47 a.m. The &quot;Old Country Buffet&quot; location is near by and avaiable for rent. Wed, Apr 4, 2012 : 10:32 p.m.
mun? You have not lived until you have eaten at a Golden Corral. OCB? Yuck. Try the one out on Wayne and Newburg. Yum. Wed, Apr 4, 2012 : 9:13 p.m.
&quot;What that area really needs is a Golden Corral.&quot; Uh, they just closed the Country Buffet on Eisenhower. Wed, Apr 4, 2012 : 6:16 p.m.
smc? Golden Corral period. We need a great buffet place. Guess I know where I am going for dinner next week. Thanks for the suggestion. Wed, Apr 4, 2012 : 1:03 p.m.
What that area really needs is a Golden Corral. Chocolate waterfall, anyone? I vote for Cracker Barrel. Seems to me that Jackson and Belleville has one and why not Ann Arbor? Wed, Apr 4, 2012 : 10:29 a.m. Yeah!! It's on my calendar! No more trips to Brighton! Wed, Apr 4, 2012 : 1:07 p.m.
My supply of EVOO is getting low, so I'll be there on opening day! Cannot WAIT! Wed, Apr 4, 2012 : 10:14 a.m. I hope someone has the traffic flow figured out that intersection is already very busy. I'm sure with all the great minds at Pittsfield Township that was done already. We Welcome you Costco at least we did not have all the uproar that was made over the Wal-mart Store. Believe it or not Capitalism WORKS! Wed, Apr 4, 2012 : 4:50 p.m.
the round about is not to be started until spring 2013 and will be done in time for the football season. Wed, Apr 4, 2012 : 1:30 p.m.
What, no one chained herself to a bulldozer? I am thinking the round abouts will be in place by then?